The government of Eritrea says its forces killed more than 200 Ethiopian troops and wounded more than 300 during fighting Sunday and Monday in a contested border area. There has been no independent confirmation of the figures, released by Eritrea in a government statement Thursday. "A retreating army and an army in disarray under normal circumstances does not have a sense of what happened," he said. Both countries have claimed the upper hand in the fighting, which took place in the area of Tsorona, an Eritrean town that was a flashpoint during the border war the countries fought between 1998 and 2000. Eritrea said Thursday that its forces "quashed" the Ethiopian attack and forced the troops to retreat beyond their starting points. Ethiopia has said its force drove back an Eritrean attack and chose to withdaw from the site of the clash "once our objective was achieved." The U.S. Department of State expressed concern over the military action, calling on both sides to exercise restraint. "We also urge both Ethiopia and Eritrea to cooperate in promoting stability and sustainable peace in the region," U.S. Department of State spokesman John Kirby said in a statement Tuesday. 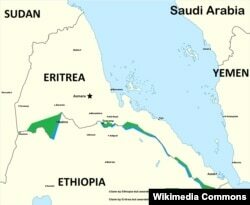 Eritrea has appealed to the United Nations Security Council to condemn what it called a military offensive by Ethiopia. The border war between Eritrea and Ethiopia killed an estimated 70,000 people. Since then, the two countries have fought periodic battles on their boundary, the most recent before this week coming in 2012. Both governments accused the other of starting the latest battle to distract attention from political problems and internal opposition.